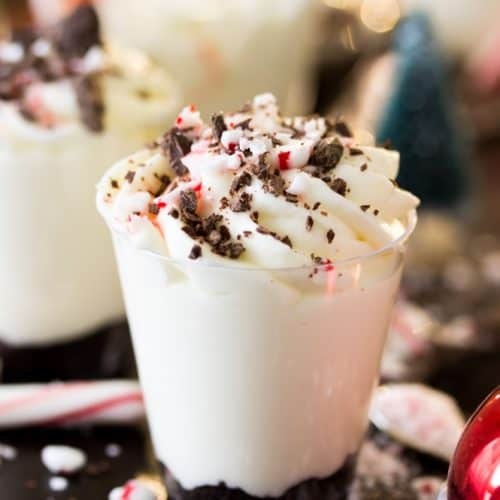 These Peppermint Bark Cheesecake Shooters are made with a no-bake white chocolate peppermint cheesecake piped over a chocolate cookie crust. 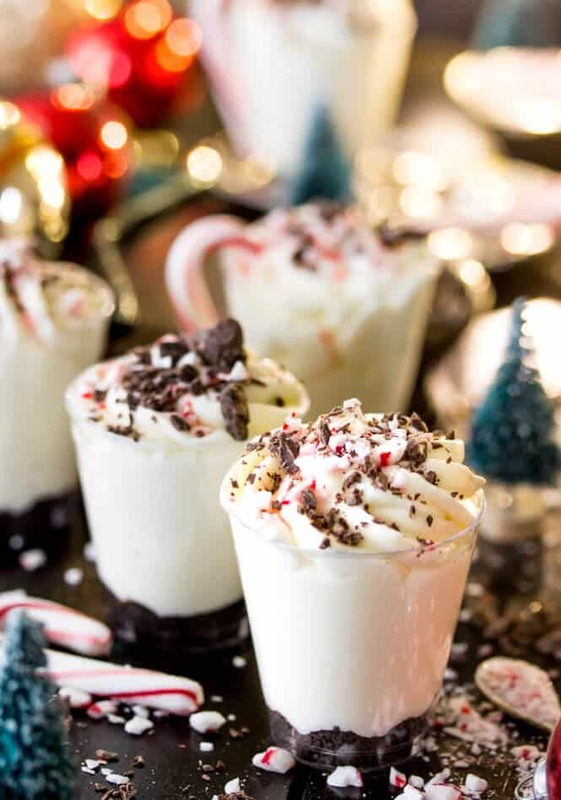 Top everything off with crushed candy cane pieces and chocolate flakes for a simple, festive treat! Only 4 days left til Christmas, and I have so much gift-wrapping to do! I still exchange gifts with all 5 of my siblings (and my parents) and I have a pile of gifts for Zach stowed away at my parents’ house, and there’s an untouched roll of wrapping paper lying on my dining room table. 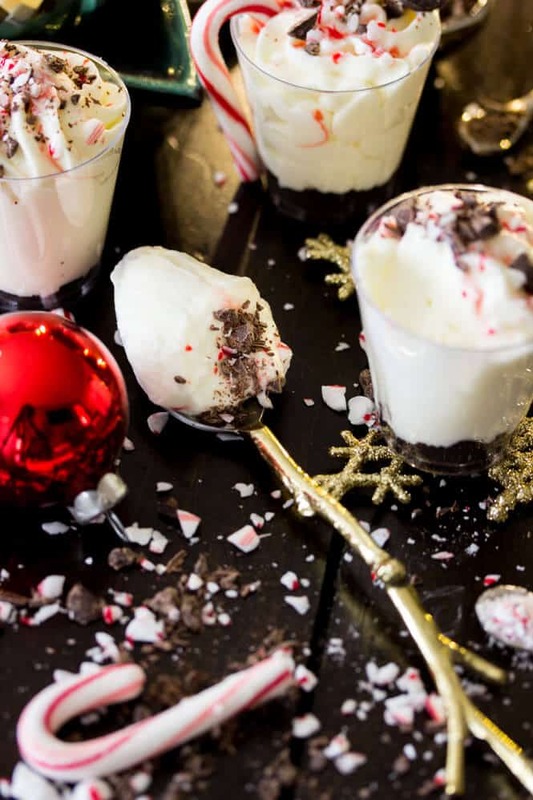 I should be wrapping, instead I’m obsessing over dessert shooters, and today I’m sharing these Peppermint Bark Dessert Shooters with you. 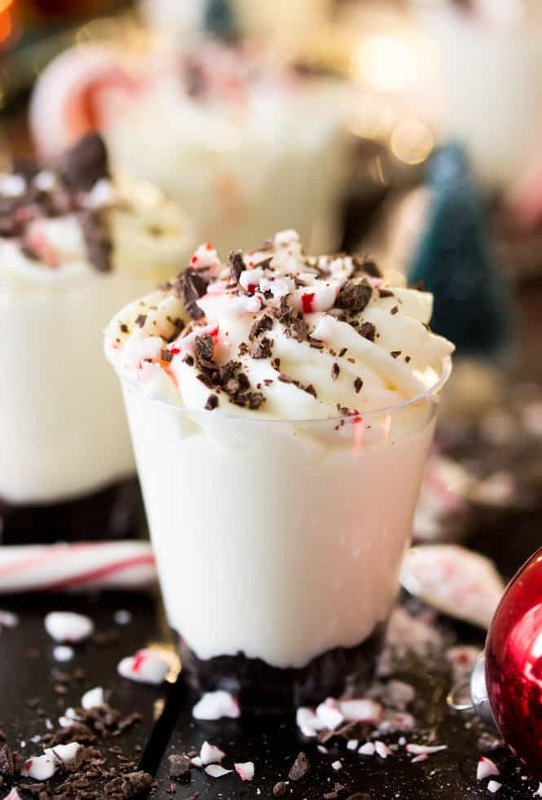 I’d been toying with the idea of creating a Christmas/winter-themed dessert shooter (especially after so many people enjoyed my Halloween version!) but I put it off, and put it off, and now, here we are less than a week before Christmas and I’m throwing this one at you. I seem to have a thing for Peppermint Bark, I think this is my third inspired recipe this year, and on exactly this day in 2015 I posted these Peppermint Bark Cookies. Consistently again, this dessert shooter is similar to most (all?) of my other ones in that the filling is cream cheese based. Partially this is because I just love cheesecake in general, but it’s also because the cream cheese serves as a very stable, rich (but not overly sweet) base. Its flavor pairs well with… just about anything and it also works nicely when lightened up (texture-wise, not calorie-wise) with homemade whipped cream. Here, I paired the cream cheese with a white chocolate ganache (just white chocolate and heavy cream melted together) to give it a true peppermint bark flavor. I used regular Oreos for the crust here, but if you like a little more mint flavor you could substitute Peppermint Oreos (the seasonal ones with the red filling — I don’t recommend the “mint” ones with the green filling). I chopped up some chocolate chips along with the cookies (tossed them into the food processor) for an extra rich chocolate crust. I wanted a “present, but subtle” and certainly not overpowering amount of peppermint flavor and used less than a teaspoon in the whole batch. 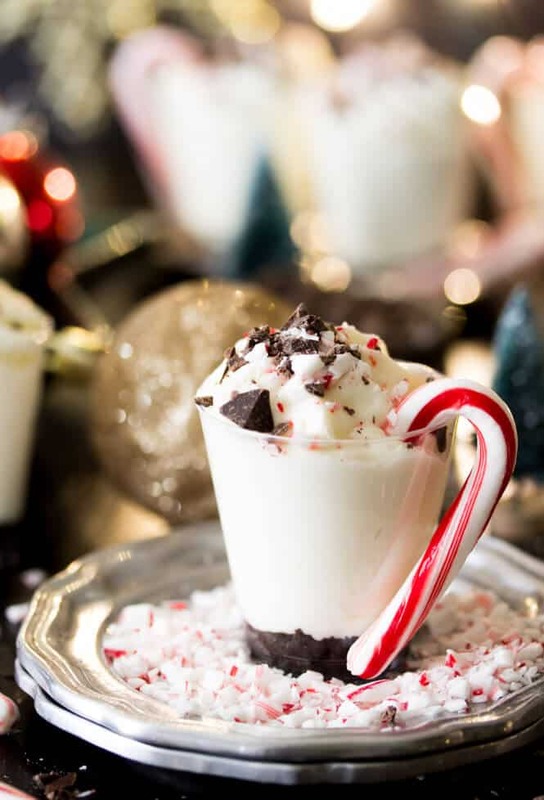 For me, this was plenty — enough to evoke the flavor of its Peppermint Bark namesake, and I accented it with just a dash of vanilla. As with the Oreo cookies, make sure to use “Peppermint” flavored extract and not “Mint” extract for an authentic peppermint taste. 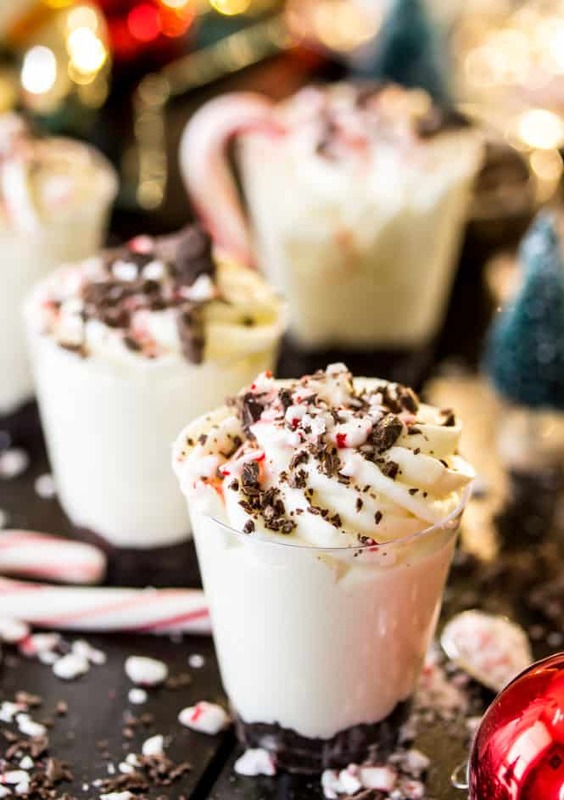 Enjoy — and while you can always find my dessert shooter recipes on my site, make sure to subscribe and find all 8 of my previous dessert shooter recipes neatly compiled in my FREE E-BOOK! I am gluten free by choice, not a doctor. I discovered by my own testing and notes that my arthritis was getting worse and pain pills were my daily add-on. I am now 3 months without gluten or wheat and without pain medicine. When I put it back in my diet the pain comes back also.